Here you have another mexican recipe! I hope you like it! Chicken Mixiotes, a delicious and flavor Steamed chicken with cactus in a red Sauce! So delicious! Remove the stems and some of the seeds from the dry chillies. In a large skillet on high heat, add a bit of oil, and toast the dry chillies together with a chunk of onion and two garlic cloves. Toast the dry chillies for about 30 seconds on each side, then remove them from the heat and place them in a blender. Continue to toast the onion and garlic for a few more minutes until they soften a bit, then also place them in the blender with the dry chilies. Into the blender also add in one cup of warm water, and season with the bay leaves, the thyme, rosemary and salt to taste. Blend on high until everything is well blended in a soft sauce. Once the sauce is ready, taste the flavor add more salt if needed and set the sauce aside to cool down completely. With a small knife make a few cuts on each chicken drumstick, then place the chicken drumstick in a large container. Season the chicken with salt and pepper to taste. Pour the red sauce (it should be cold by now) all over the chicken, marinate the chicken in the red sauce for at least 20 minutes. Cut the nopales (cactus) into thin strips. Cook them in salted boiling water for about 30 minutes or until tender. Once they are done, drain them. Cut 5 pieces of aluminum foil, each foil piece should be enough to wrap one of the chicken pieces. Place a piece of chicken right on the center o a piece of aluminum foil, then top the chicken with some of the cactus strips and top it with about 2 - 3 tablespoons of the red sauce (the same sauce that you use to marinate the chicken). Wrap the chicken with the aluminum foil and keep on repeating these steps until all the chicken pieces are wrapped in foil. Place the chicken pieces in a steamer, and cook on high heat for 45 minutes or until they are well cooked. Once the chicken is done, now you can serve it. 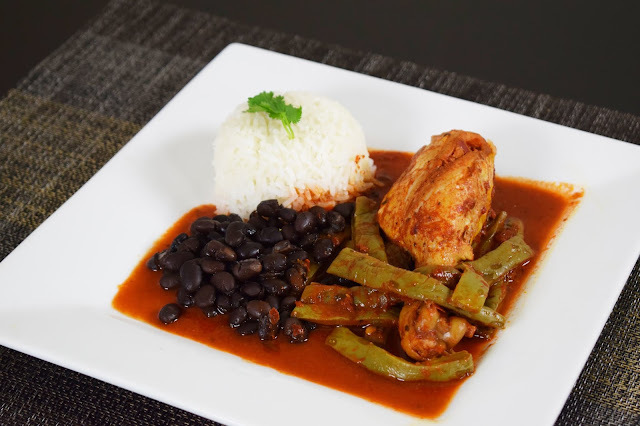 I served with with rice and beans and it is simply delicious!